"Romantics worldwide will adore the richly sonorous solo piano of Jon England - the master Pianotainer who conducts his seduction at the smoothest grand-piano you will ever hear. Each tune frames the seasons of delight in romance (new and not-so-new) and is perfect for heart-rich encounters at any time of day or night. 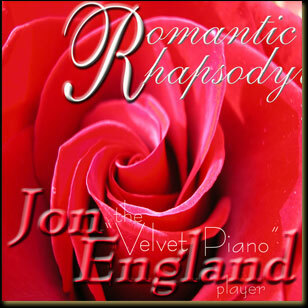 Download this collection of 17 multi-million-selling classics and standards in "Romantic Rhapsody" and listen as each tinkling note; each flowing glissando and arpeggio deftly fans the emerging embers of attraction with grace, style and a certain "je ne sais quoi" essential to ensure the robust flames of musical mellifluousness burn brightly in ears and hearts alike. For sharing, giving, or enjoying as a prelude to the most delightful occasions of our lives.